Lots of charts to cover today, since the next week or two should be important. While price action has been nothing but bullish, the market has stalled right at the level it needed to in order to keep bears' hopes alive. Most indicators suggest higher prices still to come, but the market has reached an inflection point, and it is presently unclear if the longer-term wave counts will extend upwards more significantly or not. The first chart of import (pun intended) is light crude oil, which I discussed a few days ago -- and which then immediately whipsawed the recent breakout. I mentioned that the green trendline was a "must defend" level for bulls, and the results of the whipsaw beneath that trendline have been ugly. 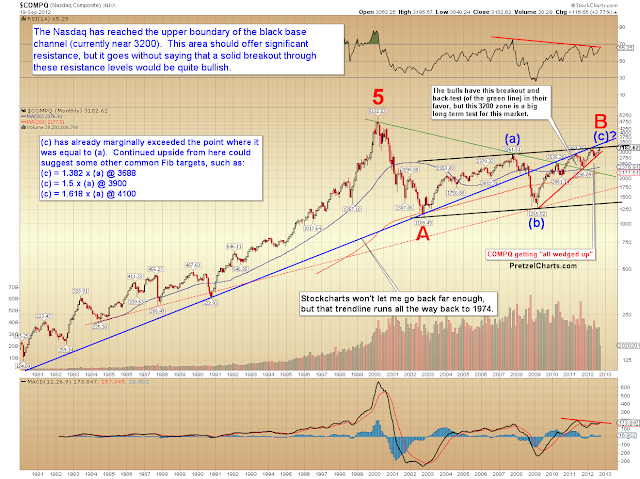 The problem oil presents for equities bulls is that continued weakness in this market could imply a failure of the QE-Infinity reflation trade, and thus ultimately drag equities down with it. The next chart is the US Dollar, which started a relentless crash immediately after I switched from long-term dollar-bullish to dollar-neutral. 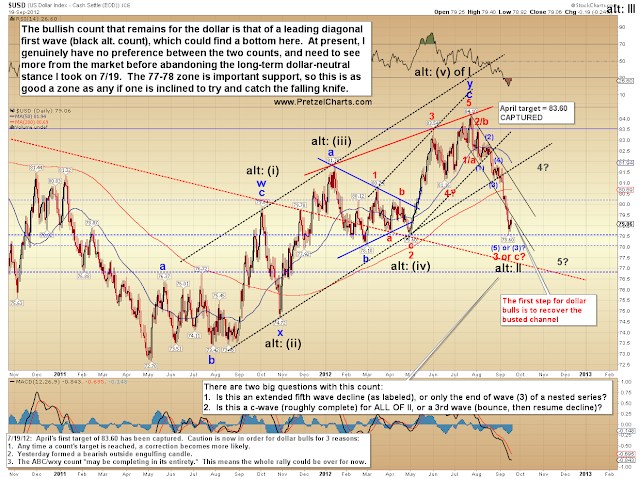 It has now reached important support, and if it's going to muster a bounce, this is a zone dollar bulls must defend. One can already see the potential of a head and shoulders top formation if we get a decent bounce to form a right shoulder, but I'm not yet entirely convinced it can't put in a meaningful bottom soon. In the last few sessions, I've finally started to take quick stabs at long dollar positions again, with tight stops (since my conviction is low, given the price action). 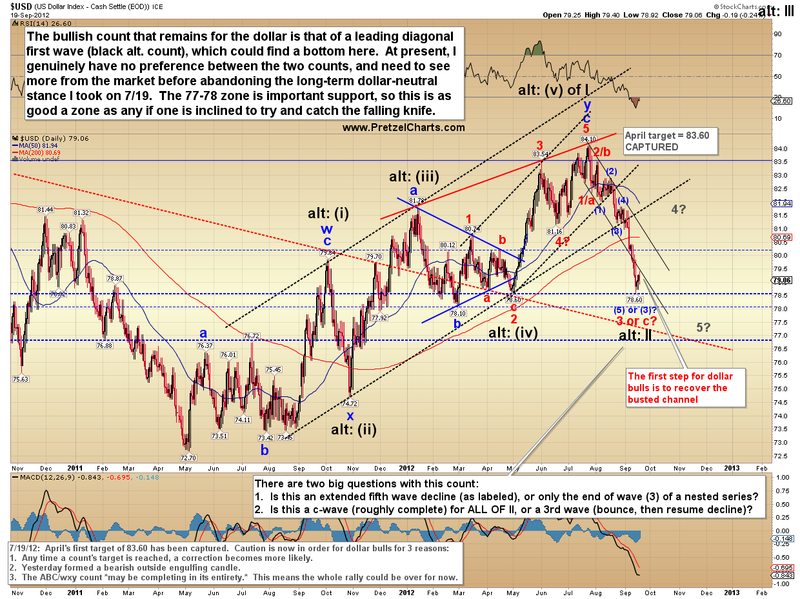 The dollar is still in the long-term flux-zone, and so are equities. 1. 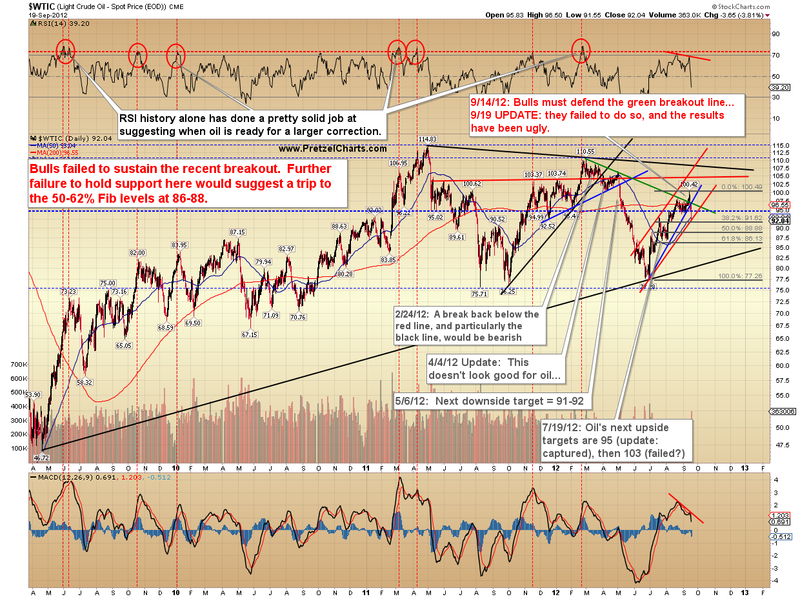 The recent breakout above a 5-year resistance zone (bullish). 2. 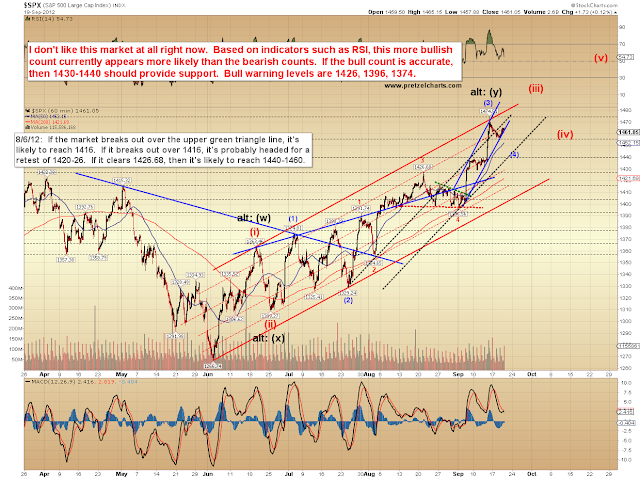 8718 is still intact (not bullish -- not really bearish either, but important). 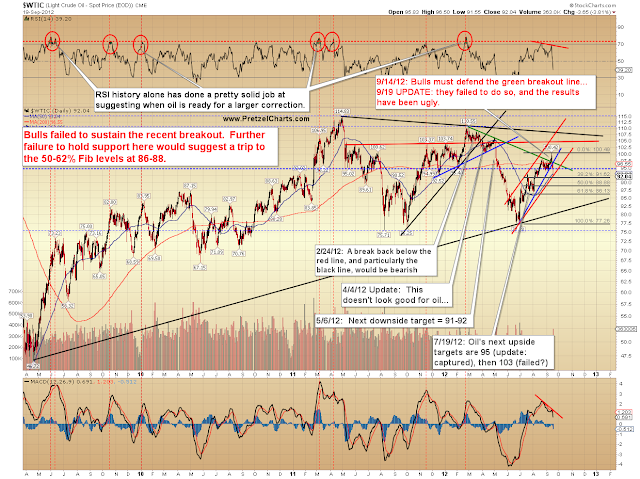 If you just take a "trade what you see" approach here, then this breakout can't be viewed as anything but bullish. If you take the "paranoid skeptical contrarian" approach (my usual favorite), then this is the last hurrah head-fake move that keeps everyone on the wrong side of the trade the whole way down. 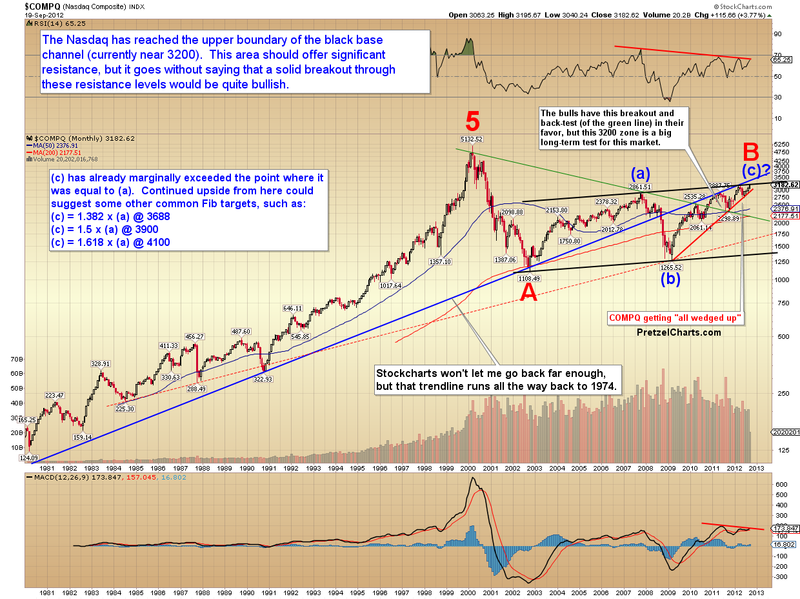 The bottom line here, though, is that no bear case can be seen in the price action at the present moment. 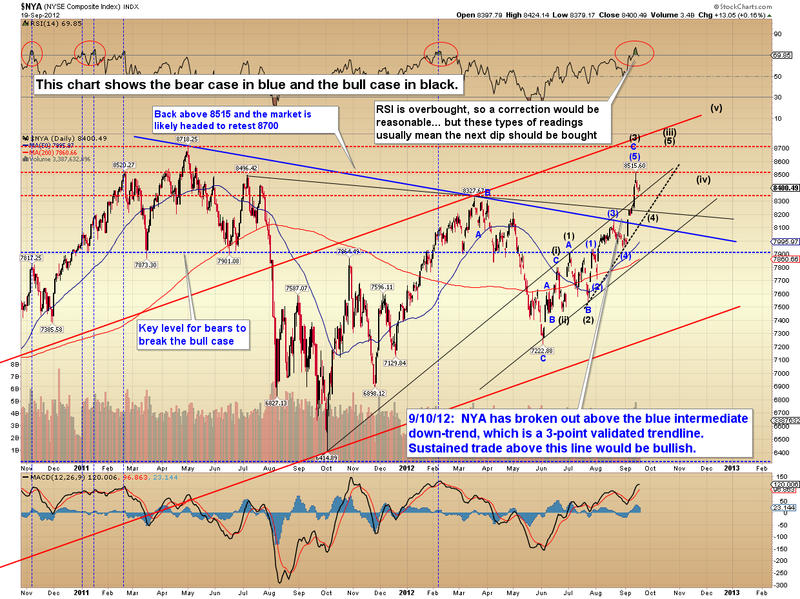 I've labeled the next chart with the bearish (blue) and bullish counts (black). Again, while RSI is overbought and suggests a correction, these types of RSI readings (with no divergence) seldom come at the exact top. Normally, we'd expect at least one retest/new price high with a divergent reading. 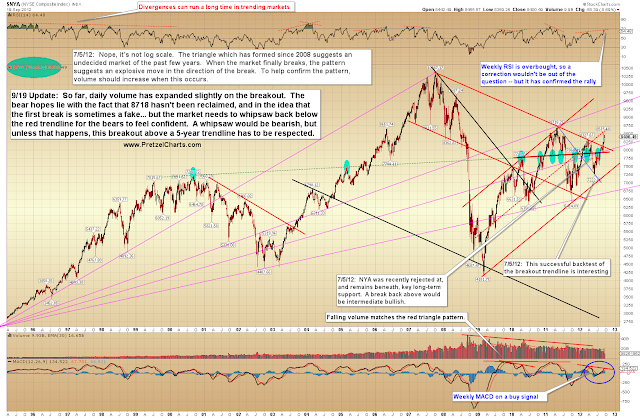 Next is the long-term Nasdaq Composite (COMPQ), which has reached the upper boundary of the parallel base channel. As I discussed on September 12, this area was expected to be resistance -- the market is still in the process of testing this resistance and has yet to declare its intentions. 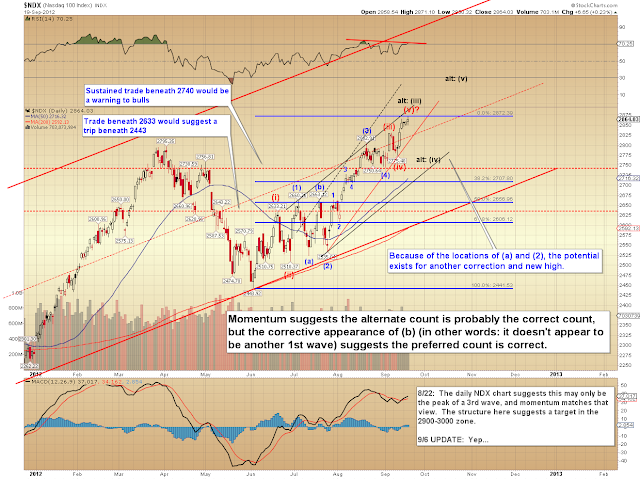 The Nasdaq 100 (QQQ) now displays the potential of a complete wave, but here again, hasn't given off any bearish signals yet -- the first step for bears would be trade beneath the red wave (iv) low. As discussed, exactly how this wave fits into the big picture right now is unclear. 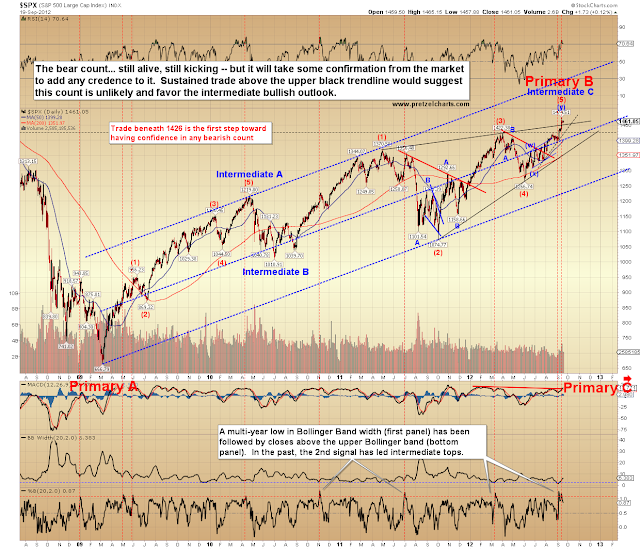 The S&P 500 (SPX) wave counts below. 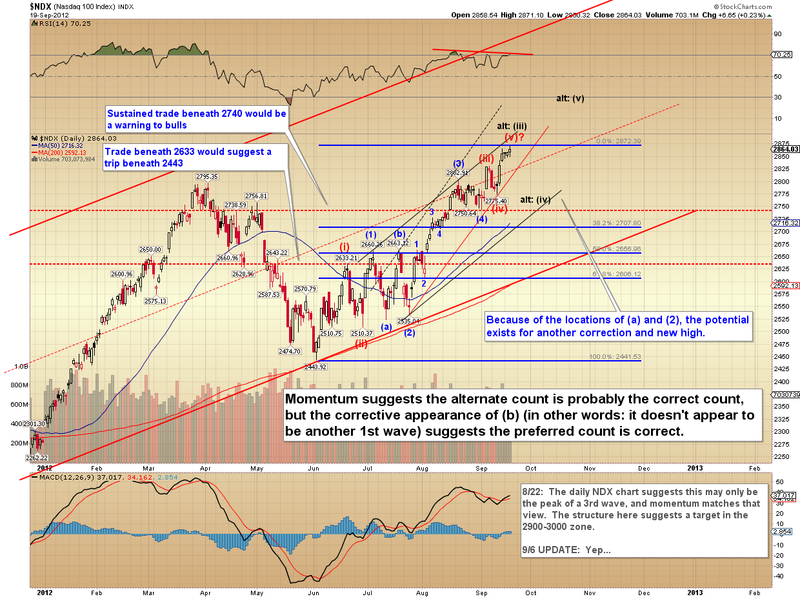 It remains difficult to triangulate the counts right now, and the next decent correction will help clarify things. 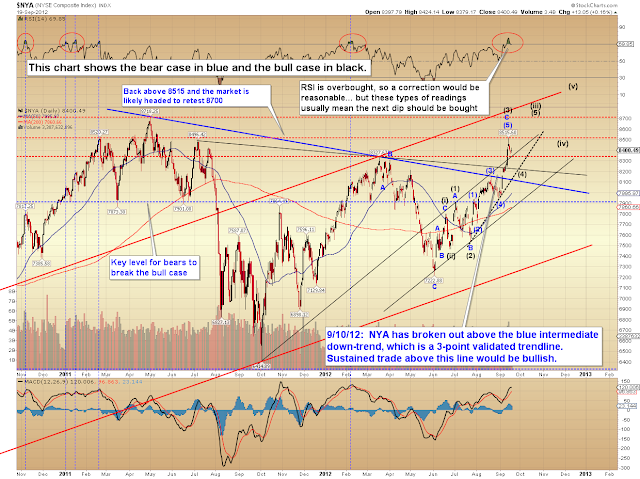 In the big picture, the bearish ending diagonal still can't be eliminated. 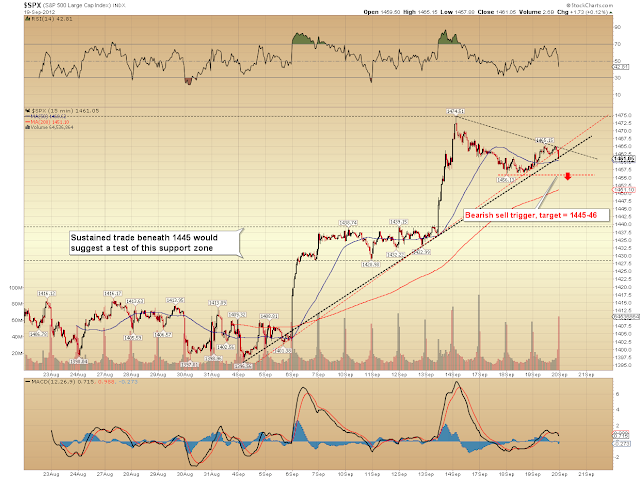 The short-term SPX chart displays a trade trigger and some levels which should offer clues to short-term direction. In conclusion, I don't think there's much to add down here. The next few sessions will hopefully shed some much-needed light on the market's intentions. Trade safe.